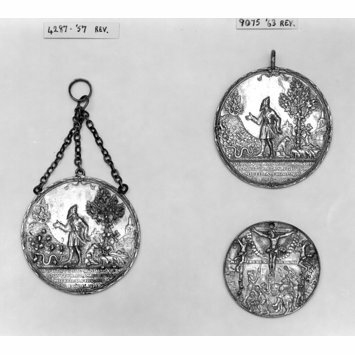 This medallion with three suspension chains is made by Hans Reinhart the Elder (ca. 1500/10 - 1581). It depicts on the obverse the offerings of the Magi and on the reverse Moses and the burning bush. There are Latin quotations of the bible at bottom and it is inscribed H.R. Hans Reinhart the Elder was a German goldsmith and medallist, who worked for the Court of Saxony in Dresden. Reinhart's medals, mainly produced between 1535 and 1545, were marked with his initials H R.
It is worth mentioning that he cast his medals from wooden models and not, as was usual in goldsmith work from stone models. His work as medallist is not extensive, Habich lists fewer than 50 medals. 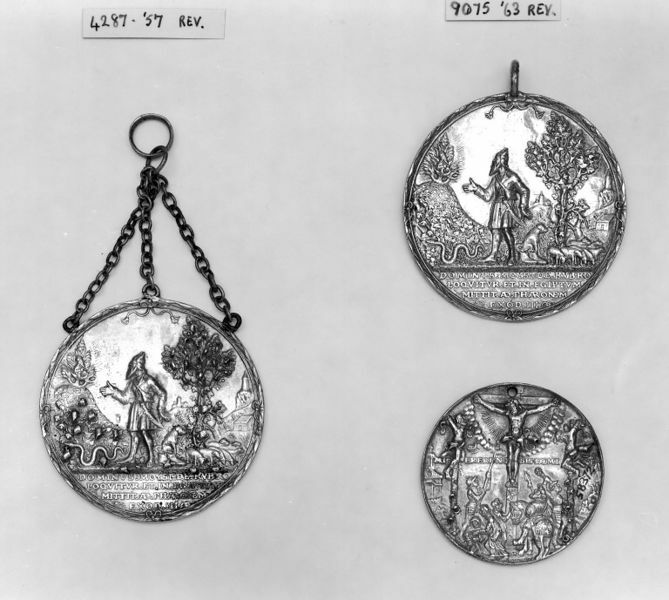 Medallion with three suspension chains. Depicting: Obv. : the offerings of the Magi; rev. : Moses and the burning bush; Latin quotations of the bible at bottom. Inscribed H.R. Trusted, Marjorie. German Renaissance Medals. Victoria & Albert Museum, 1990. p. 95, ill. ISBN 1851770135. Kuhn, Dr. Katalog für die Ausstellung der Werke älterer Meister. Part II: Katalog der Kunst und Kunstindustrie-Ausstellung alter und neuer deutscher Meister. Munich, Glaspalast, 1876, cat.no. 510. Habich, catalog, II,I, p. 285, no. 1971, pl. CCX, 2.